Hi Augustus o César Augusto amo an naging siyahan nga emperador han Imperyo Romano, nga iya ginhadian tikang ha 27 BC ngadto ha iya kamatayan ha AD 14. Ando, Clifford, Imnperial ideology and provincial loyalty in the Roman Empire, University of California Press, 2000. Bivar, A.D.H. (1983). "The Political History of Iran Under the Arsacids", in The Cambridge History of Iran (Vol 3:1), 21–99. Edited by Ehsan Yarshater. London, New York, New Rochelle, Melbourne, and Sydney: Cambridge University Press. ISBN 978-0-521-20092-9. Bowersock, G. W. (1990). "The Pontificate of Augustus". In Kurt A. Raaflaub and Mark Toher (eds.). Between Republic and Empire: Interpretations of Augustus and his Principate. Berkeley: University of California Press. pp. 380–394. ISBN 978-0-520-08447-6. Dio, Cassius. (1987) The Roman History: The Reign of Augustus. Translated by Ian Scott-Kilvert. London: Penguin Books. ISBN 978-0-14-044448-3. Eck, Werner; translated by Deborah Lucas Schneider; new material by Sarolta A. Takács. (2003) The Age of Augustus. Oxford: Blackwell Publishing (hardcover, ISBN 978-0-631-22957-5; paperback, ISBN 978-0-631-22958-2). Everitt, Anthony (2008) Augustus: The Life of Rome's First Emperor. Random House Books. ISBN 1-4000-6128-8. Green, Peter (1990). Alexannder to Actium: The Historical Evolution of the Hellenistic Age. Hellenistic Culture and Society. Berkeley, CA; Los Angeles; London: University of California Press. ISBN 0-520-05611-6 (hbk. ); ISBN 0-520-08349-0 (pbk.). Suetonius, Gaius Tranquillus (1931). Lives of the Twelve Caesars. New York: Modern Library. Shotter, D.C.A. "Tiberius and the Spirit of Augustus", Greece & Rome (Volume 13, Number 2, 1966): 207–212. Syme, Ronald (1939). The Roman Revolution. Oxford: Oxford University Press. ISBN 0-19-280320-4 (pbk.). Buchan, John (1937). Augustus. Boston: Houghton Mifflin Co.
Galinsky, Karl. Augustan Culture. Princeton, NJ: Princeton University Press, 1998 (paperback, ISBN 978-0-691-05890-0). Grant, Michael (1985). The Roman Emperors: A Biographical Guide to the Rulers of Imperial Rome, 31 BC — AD 476. New York: Charles Scribner's Sons. Jones, A.H.M. "The Imperium of Augustus", The Journal of Roman Studies, Vol. 41, Parts 1 and 2. (1951), pp. 112–119. Jones, A.H.M. Augustus. London: Chatto & Windus, 1970 (paperback, ISBN 978-0-7011-1626-2). Massie, Allan (1984). The Caesars. New York: Franklin Watts. Osgood, Josiah. Caesar's Legacy: Civil War and the Emergence of the Roman Empire. New York: Cambridge University Press (USA), 2006 (hardback, ISBN 978-0-521-85582-2; paperback, ISBN 978-0-521-67177-4). Raaflaub, Kurt A. and Toher, Mark (eds.). Between Republic and Empire: Interpretations of Augustus and His Principate. Berkeley; Los Angeles: University of California Press, 1993 (paperback, ISBN 978-0-520-08447-6). Reinhold, Meyer. The Golden Age of Augustus (Aspects of Antiquity). Toronto, ON: Univ. of Toronto Press, 1978 (hardcover, ISBN 978-0-89522-007-3; paperback, ISBN 978-0-89522-008-0). Shotter, D. C. A. (1991). 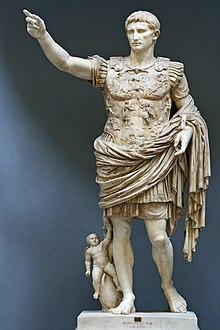 Augustus Caesar. Lancaster Pamphlets. London: Routledge. Southern, Pat. Augustus (Roman Imperial Biographies). New York: Routledge, 1998 (hardcover, ISBN 978-0-415-16631-7); 2001 (paperback, ISBN 978-0-415-25855-5). Zanker, Paul. The Power of Images in the Age of Augustus (Thomas Spencer Jerome Lectures). Ann Arbor, MI: University of Michigan Press, 1989 (hardcover, ISBN 978-0-472-10101-6); 1990 (paperback, ISBN 978-0-472-08124-0). The Via Iulia Augusta: road built by the Romans; constructed on the orders of Augustus between the 13–12 B.C. Brown, F. The Achievements of Augustus Caesar, Clio History Journal, 2009. Ini nga pakli kataposan nga ginliwat dida han 21:29, 29 Nobyembre 2014.